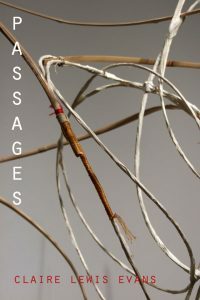 The UA Department of Art and Art History is pleased to announce Passages, Claire Lewis Evans’ MFA exhibition, April 2-23. The exhibition will be on view at The Grocery, 900 Main Avenue in Northport, Alabama, which will be open for Art Night on Thursday, April 2 from 6:00-8:00 pm. A closing reception will be held on Saturday, April 18 from 3:00-5:30 pm, and the gallery will also be open for special events and other hours by appointment. Lewis Evans is a prolific artist and writer who shows regularly in regional and national exhibitions. In addition to her own creative work, she is a co-founder of The Grocery, an artist-run studio, exhibit and performance space in downtown historic Northport and the intellectual property manager at the University of Alabama Press. She holds an MA in communication (film and video) and a BFA in studio art (printmaking) from Georgia State University. The sculptural works featured in Passages reflect Lewis Evans’ interest in material, process and time and how these fundamental aspects of the world both inform and are informed by artistic attention. Her explorations of form and space allow Lewis Evans to help create the universe, shaping matter and experience as the work unfolds. 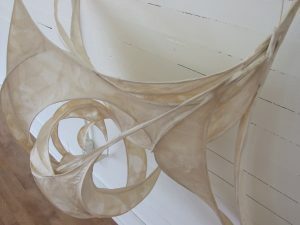 While Lewis Evans’ work can be approached simply as abstract sculpture, it is deeply informed by her longstanding interest in spirituality and the environment, as well as more recent reflections on the fragility and resiliency of art and life in the face of the unknown. You may read more about her creative work and thinking on her blog, Sometimes I’m an Artist. A Facebook event page for Passages is here: https://www.facebook.com/events/1584341311849954/ and The Grocery’s website is here: http://www.groceryartplace.com/. Image credit: Claire Lewis Evans. Image courtesy of the artist.